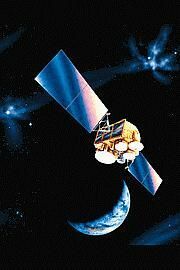 American military communications satellite. DSCS satellites provided secure voice and data communications for the US military. AKA: Defense Satellite Communications System;DSCS. Status: Operational 1982. First Launch: 1982-10-30. Last Launch: 2003-08-29. Number: 15 . Gross mass: 2,613 kg (5,760 lb). Height: 2.10 m (6.80 ft). Span: 11.50 m (37.70 ft). The contract was managed by the DCA (Defense Communications Agency) for the USAF. General Electric the received contract in February 1977 for DSCS III. The first launch was in 1982. Recurring cost was quoted as $160 million in Aviation Week on 7 August 1995. DSCS-3 Communication satellite built by Lockheed Martin for USAF, USA. Launched 1982 - 2003. Used the DSCS-3 Bus, 3-Axis stabilization bus. Family: Communications, Geosynchronous orbit, Military communications sat. Country: USA. Launch Vehicles: Titan, Atlas, Space Shuttle, Titan 34D/IUS, Titan 34D, Titan 34D/Transtage, Atlas II, Atlas IIA, Delta IV, Delta 4M. Projects: DSCS. Launch Sites: Cape Canaveral, Cape Canaveral LC36A, Cape Canaveral LC37B, Cape Canaveral LC40, Cape Canaveral LC39A. Agency: USAF, Astro Space. Bibliography: 2, 278, 4, 552, 554, 6, 6462, 12255. 1976 February 2 - . DSCS III contracts. - . Spacecraft: DSCS III. SAMSO awarded R&D contracts to General Electric Company, Space Division (FO4701-76-C-0092) and to Hughes Aircraft Company (FO4701-76-C-0093) for DSCS III..
DSCS III preliminary designs review - . Spacecraft: DSCS III. DSCS III subsystem and system preliminary designs reviews were held throughout the month..
DSCS III satellite transponder - . Spacecraft: DSCS III. HQ USAF approved full-scale development of a single channel transponder for the AFSATCOM program, to be deployed on DSCS III satellites. A contract for the development of the transponder was awarded..
1977 February 2 - . Contract for Phase II of the DSCS III program. - . Spacecraft: DSCS III. SAMSO awarded a contract for Phase II of the DSCS III program to the General Electric Company. GE was to build and test one qualification model satellite and two flight model satellites..
1982 October 30 - . 04:05 GMT - . Launch Site: Cape Canaveral. Launch Complex: Cape Canaveral LC40. LV Family: Titan. Launch Vehicle: Titan 34D/IUS. DSCS III-01 - . Payload: DSCS III F-1. Mass: 2,613 kg (5,760 lb). Nation: USA. Agency: USAF. Program: DSCS. Class: Communications. Type: Military communications satellite. Spacecraft: DSCS III. USAF Sat Cat: 13637 . COSPAR: 1982-106B. Apogee: 36,171 km (22,475 mi). Perigee: 36,132 km (22,451 mi). Inclination: 8.80 deg. Period: 1,454.80 min. Positioned in geosynchronous orbit at 105 deg W in 1982-1983; 135 deg W in 1983-1989; 130 deg W in 1989-1999. As of 2006 Sep 9 located at 94.39E drifting at 5.469W degrees per day..
USA 11 - . Payload: DSCS III F-2. Mass: 2,613 kg (5,760 lb). Nation: USA. Agency: USAF. Program: DSCS. Class: Communications. Type: Military communications satellite. Spacecraft: DSCS III. USAF Sat Cat: 16116 . COSPAR: 1985-092B. Apogee: 35,963 km (22,346 mi). Perigee: 35,434 km (22,017 mi). Inclination: 0.30 deg. Period: 1,436.00 min. Released from STS 51J 10/4/85. Spacecraft engaged in practical applications and uses of space technology such as weather or communication (US Cat C). Positioned in geosynchronous orbit; at 12 deg W in 1986; 42 deg W in 1995..
USA 12 - . Payload: DSCS III F-3. Mass: 2,613 kg (5,760 lb). Nation: USA. Agency: USAF. Program: DSCS. Class: Communications. Type: Military communications satellite. Spacecraft: DSCS III. USAF Sat Cat: 16117 . COSPAR: 1985-092C. Apogee: 35,963 km (22,346 mi). Perigee: 35,633 km (22,141 mi). Inclination: 0.30 deg. Period: 1,436.00 min. Released from STS 51J 4 October 1985; boosted into orbit with DSCS 3 F3 on single IUS booster. Spacecraft engaged in practical applications and uses of space technology such as weather or communication (US Cat C). Positioned in geosynchronous orbit; at 180 deg E in 1994. 1989 September 4 - . 05:54 GMT - . Launch Site: Cape Canaveral. Launch Complex: Cape Canaveral LC40. LV Family: Titan. Launch Vehicle: Titan 34D/Transtage. USA 43 - . Payload: DSCS II F-16. Mass: 2,613 kg (5,760 lb). Nation: USA. Agency: USAF. Program: DSCS. Class: Communications. Type: Military communications satellite. Spacecraft: DSCS III. USAF Sat Cat: 20202 . COSPAR: 1989-069A. Apogee: 35,799 km (22,244 mi). Perigee: 35,777 km (22,230 mi). Inclination: 6.10 deg. Period: 1,436.10 min. Spacecraft engaged in practical applications and uses of space technology such as weather or communication (US Cat C). Positioned in geosynchronous orbit; at 57 deg E in 1995..
USA 44 - . Payload: DSCS III F-4. Mass: 2,613 kg (5,760 lb). Nation: USA. Agency: USAF. Program: DSCS. Class: Communications. Type: Military communications satellite. Spacecraft: DSCS III. USAF Sat Cat: 20203 . COSPAR: 1989-069B. Apogee: 35,808 km (22,250 mi). Perigee: 35,771 km (22,227 mi). Inclination: 5.00 deg. Period: 1,436.30 min. Spacecraft engaged in practical applications and uses of space technology such as weather or communication (US Cat C). 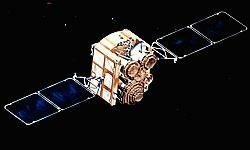 Positioned in geosynchronous orbit; at 60 deg E in 1995..
1992 February 11 - . 00:41 GMT - . Launch Site: Cape Canaveral. Launch Complex: Cape Canaveral LC36A. LV Family: Atlas. Launch Vehicle: Atlas II. USA 78 - . Payload: DSCS III B-14. Mass: 2,613 kg (5,760 lb). Nation: USA. Agency: USAF. Program: DSCS. Class: Communications. Type: Military communications satellite. Spacecraft: DSCS III. USAF Sat Cat: 21873 . COSPAR: 1992-006A. Apogee: 35,503 km (22,060 mi). Perigee: 30,675 km (19,060 mi). Inclination: 0.90 deg. Period: 1,300.50 min. Spacecraft engaged in research and exploration of the upper atmosphere or outer space (US Cat B). Launch vehicle put payload into geosynchronous transfer orbit with GCS trajectory option. Positioned in geosynchronous orbit; at 135 deg W in 1995..
1992 July 2 - . 21:54 GMT - . Launch Site: Cape Canaveral. Launch Complex: Cape Canaveral LC36A. LV Family: Atlas. Launch Vehicle: Atlas II. USA 82 - . Payload: DSCS III B-12. Mass: 2,613 kg (5,760 lb). Nation: USA. Agency: USAF. Program: DSCS. Class: Communications. Type: Military communications satellite. Spacecraft: DSCS III. USAF Sat Cat: 22009 . COSPAR: 1992-037A. Apogee: 35,800 km (22,200 mi). Perigee: 35,775 km (22,229 mi). Inclination: 0.20 deg. Period: 1,436.20 min. Launch vehicle put payload into geosynchronous transfer orbit with GCS trajectory option. Positioned in geosynchronous orbit at 12 deg W in 1995-1996. Spacecraft engaged in practical applications and uses of space technology such as weather or communication (US Cat C). 1993 July 19 - . 22:04 GMT - . Launch Site: Cape Canaveral. Launch Complex: Cape Canaveral LC36A. LV Family: Atlas. Launch Vehicle: Atlas II. USA 93 - . Payload: DSCS III B-9. Mass: 2,615 kg (5,765 lb). Nation: USA. Agency: USAF. Program: DSCS. Class: Communications. Type: Military communications satellite. Spacecraft: DSCS III. USAF Sat Cat: 22719 . COSPAR: 1993-046A. Apogee: 35,764 km (22,222 mi). Perigee: 183 km (113 mi). Inclination: 26.10 deg. Period: 625.80 min. Spacecraft engaged in practical applications and uses of space technology such as weather or communication (US Cat C). Launch vehicle put payload into geosynchronous transfer orbit with GCS trajectory option. Positioned in geosynchronous orbit at 175 deg E in 1995-1997. 1993 November 28 - . 23:40 GMT - . Launch Site: Cape Canaveral. Launch Complex: Cape Canaveral LC36A. LV Family: Atlas. Launch Vehicle: Atlas II. USA 97 - . Payload: DSCS III B-10. Mass: 2,615 kg (5,765 lb). Nation: USA. Agency: USAF. Program: DSCS. Class: Communications. Type: Military communications satellite. Spacecraft: DSCS III. USAF Sat Cat: 22915 . COSPAR: 1993-074A. Apogee: 35,501 km (22,059 mi). Perigee: 195 km (121 mi). Inclination: 26.40 deg. Period: 625.40 min. Launch vehicle put payload into geosynchronous transfer orbit with GCS trajectory option. Positioned in geosynchronous orbit at 52 deg W in 1995; 60 deg E in 1997. Spacecraft engaged in practical applications and uses of space technology such as weather or communication (US Cat C). 1995 July 31 - . 23:30 GMT - . Launch Site: Cape Canaveral. Launch Complex: Cape Canaveral LC36A. LV Family: Atlas. Launch Vehicle: Atlas IIA. USA 113 - . Payload: DSCS III B-7. Mass: 2,610 kg (5,750 lb). Nation: USA. Agency: USAF. Program: DSCS. Class: Communications. Type: Military communications satellite. Spacecraft: DSCS III. USAF Sat Cat: 23628 . COSPAR: 1995-038A. Apogee: 35,787 km (22,236 mi). Perigee: 35,787 km (22,236 mi). Inclination: 0.00 deg. Positioned in geosynchronous orbit; located at 53 deg W in 1997..